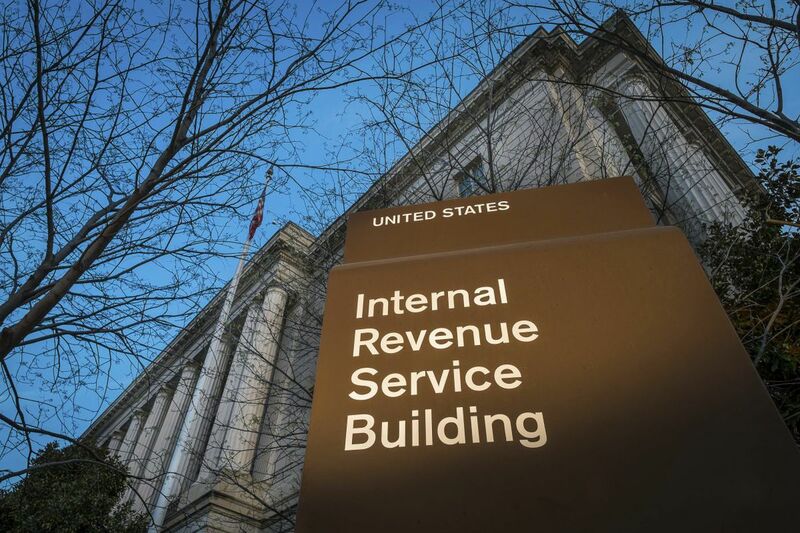 Internal Revenue Service (IRS) headquarters in Washington. WASHINGTON — When it comes to the Republican tax plan speeding toward approval, your individual results may vary. With so many moving parts, two families with the same incomes in the same town might end up with vastly different outcomes based on the number of children they have, the values of their homes, or whether they commute to Philadelphia and pay the wage tax there. "You really have to zero in on your particular tax bill, because it's really hard to generalize," said Dave Jones, the Jerome Fox Chair in Accounting, Taxation, and Financial Strategy at Temple University's business school. That's particularly true in the Philadelphia suburbs, where the new benefits of the tax bill have to be weighed against the loss of valuable deductions. The vast majority of Americans are expected to pay less, at least initially. But some will see only modest savings and millions could pay more — around 8 or 9 percent of filers according to estimates by Congress' Joint Committee on Taxation and the independent Tax Policy Center, respectively. (The picture changes dramatically over the next decade, when middle-income families face tax hikes, but Republicans insist that will be fixed by future Congresses). "The category of taxpayer that's most likely to have a negative impact are those taxpayers that currently claim itemized deductions and plan to do that in the future," said J. Richard Harvey, a professor at Villanova University's law school who worked on President Ronald Reagan's 1986 tax reform. In the Philadelphia suburbs, more than 40 percent of tax filers itemized their 2015 taxes, according to IRS data. State and local deduction reduced or eliminated: One of the most controversial proposals would scale back a deduction that can save thousands of dollars for people in Philadelphia and its suburbs, particularly in New Jersey. The deduction lets people write off amounts they've paid for property taxes or state and local income taxes. In Montgomery County the average filer who used the deduction takes more than $15,000 off his or her taxable income. Similar benefits are seen in other nearby suburbs. The House plan would limit it to $10,000 of property taxes, and the Senate was poised to adopt a similar cap Friday, according to a source familiar with the planning. "That is pretty nasty," for New Jerseyans, who face high income taxes and the country's steepest property taxes, said Patricia Dorris-Crenny, an accounting instructor at Villanova's business school. "In those high-property tax states, $10,000 isn't going to cut it … They're going to be leaving money on the table." Both bills would also eliminate the deduction for state and local income taxes — a blow to people who work in Philadelphia and pay the city's wage tax. Republicans say many taxpayers will now prefer the standard deduction, anyway, due to its increase. But Harvey said people who already take large deductions will just be trading those for the new standard deduction. "That doesn't add any benefit," he said. Another tax expert said many upper middle class taxpayers who take the largest state and local tax deductions already lose it because they get hit with the Alternative Minimum Tax. "It's not as big a deal as I think a lot of people are trying to make it out to be," said Robert Kelly, the Delaware County-based president of the Pennsylvania Society of Tax & Accounting Professionals. The House plan would eliminate the AMT, which hits more than 60 percent of the filers who make more than $200,000 in Philadelphia and its suburbs. The Senate, however, made a change Friday that would keep the AMT, only with larger exemptions. The aim is to help pay for other changes, while trying to ensure that only high-income filers pay the alternative tax. Mortgage interest: The House plan would limit the deduction for mortgage interest to the first $500,000 of debt. Existing mortgages wouldn't be affected, but anyone borrowing more than a half-million dollars for a new home would get fewer deductions. Lower Individual Rates: While the two bills have different specifics, this is the most straightforward way Republicans would lower taxes. Most people would move to a lower tax bracket. Increased standard deduction: This is Republicans' major selling point for everyday taxpayers. The standard deduction would nearly double, to around $12,000 for individuals and $24,000 for couples. That would be an instant boost to the 75 percent of Philadelphians who took the standard deduction in 2015. It would essentially make a couple's first $24,000 of earnings tax free. In a bill that gives the largest benefits to the wealthy, this feature could help people with lower incomes, tax experts said. More than four-in-10 Philadelphia filers had incomes of less than $25,000 in 2015. "More people will find themselves essentially owing zero tax," said Kimberly Burham, of the Penn Wharton Budget Model. More than half of filers took the standard deduction in the seven Pennsylvania and South Jersey counties that ring Philadelphia. Child tax credit vs personal exemptions: This one is tricky — and a prime example of how the plan takes with one hand and gives with the other. Republicans would eliminate personal exemptions worth $4,050 each for adults and their dependent children — which for many filers erases much, if not all, of that standard deduction increase. A family of three, for example, would lose $12,150 of exemptions, roughly the same as their boost in the standard deduction. Lager families would lose even more in exemptions. But Republicans would also raise the $1,000 child tax credit — to $2,000 in the Senate bill, or $1,600 in the House, adding more help to people with children. Will those credits (which directly reduce taxes owed), be better than the exemptions (which reduce the amount of dollars that are taxed)? It's hard to say. Much will depend on your tax rate and number of children. Low income people who don't make enough to owe taxes will get only a small benefit from the child tax credit, because it is not refundable. College costs could rise: Provisions that could hit college employees and graduate students have drawn protests in an area flush with educational institutions. Graduate students and school employees — from professors to secretaries to janitors — would be taxed on the value of tuition reductions they receive, even though they'd be taking home no more money. So, said Dorris-Crenny, a hypothetical administrative assistant at Villanova who makes $40,000 and whose daughter gets a $40,000 tuition reduction would now be taxed as if he makes $80,000 — leading to a potentially huge tax hike. The House version would also hit people who borrow to go to college by eliminating the deduction for student loan interest.